Soon, powerful quantum computers will be able to easily crack conventional mathematically encrypted codes. Entangled photons generated by a spaceborne quantum source could enable hack-proof key exchange for ultra high security applications. A Fraunhofer research team has developed a high performance quantum source robust enough for deployment in space. They aim to launch the first European quantum satellite in some four years' time. Gold and futuristic looking, but no larger than a bread box, this device has really been put through its paces – enduring vast leaps in temperatures from minus 40 to plus 60 degrees celsius, exposure to cold and heat in vacuum, and jarring rodeo rides on a triple-axis vibrating platform. Throughout this excruciating campaign, the device had to demonstrate its unwavering robustness and high performance. 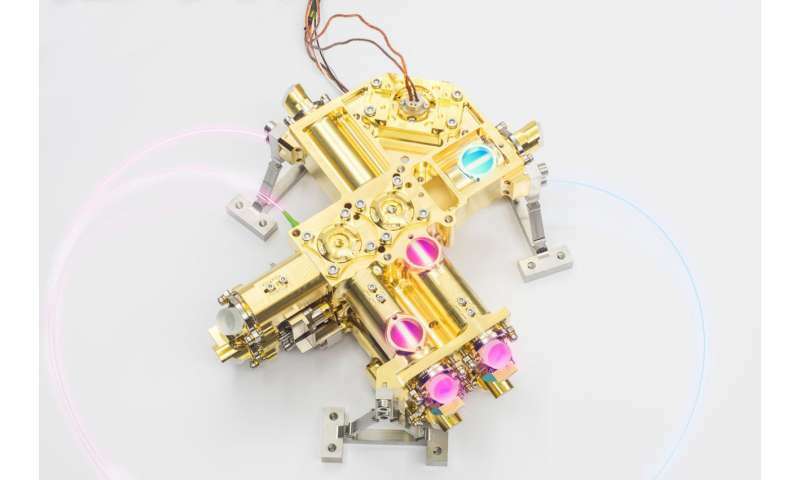 When this quantum source passed the last of a grueling battery of stress tests conducted to the European Space Agency's stringent standards, it was deemed space-worthy. Clearly, this rugged little box would survive a rocket launch and hold up under harsh off-planet conditions. For the first time researchers at the Fraunhofer Institute for Applied Optics and Precision Engineering IOF in Jena succeeded in developing a remarkably stable yet powerful quantum source. It can generate 300,000 entangled photon pairs per second when the light from a laser beam hits a non-linear crystal. These twinned light particles enable sensitive messages to be securely encrypted. Here is how it works: The two photons' polarization remains entangled – that is, correlated – no matter how far apart they may be. This allows two communicating parties to produce and share keys and immediately detect if a third-party attempts to intercept their communication. If an unauthorized party tampers with the message, the two photons disentangle to reveal that a hacking attempt is underway. But why does the quantum source have to be in space? Entangled photons could also travel via fiber optic cables such as telephone lines. But this would cut the range short and impede the important process of photon entanglement. A far better option is to piggy-back the quantum source on a satellite and send it into low Earth orbit, where it can transmit the twinned light particles down to the planet from an altitude of 400 kilometers with minimal disturbance. "The quantum source's stability and performance presented the greatest challenges because the loss rate is still high on the way through the Earth's atmosphere. This is why it is so important to generate as many entangled twin photons as possible to maximize the number of photons that reach the communicating parties on Earth," explains Fraunhofer IOF project manager Dr. Oliver de Vries. One key always requires several pairs of photons. Expounding further on this, de Vries adds, "We optimized the quantum source's stability with a smart design, effective inorganic bonding processes, and robust materials that do not expand much in the event of temperature changes." The technology is already attracting a lot of attention, particularly from banks and government agencies that rely on secure communication. However, the infrastructure needed to share keys has yet to be established before quantum encryption can be implemented in three to five years' time. The communicating parties would have to receive the light particles with a device like a telescope. This device, in turn, would have to be integrated into the IT structure. Dr. de Vries already has a plan in mind. "I could imagine a business model where Fraunhofer equips the satellite with a quantum source and outside partners offer the reception infrastructure and sell the keys." The research team's express goal is to send the first European quantum satellite into space in around four years.